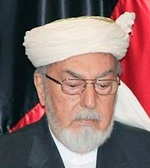 Khaama Press: An influential political and religious figure Pir Syed Ahmad Gilani has been appointed as the new Chief of the Afghan High Peace Council. The former Afghan Vice President Karim Khalili has been appointed as the Deputy Chief of the High Peace Council along with Mawlavi Ata-ur-Rehman, Mawlavi Khaibar and Habiba Surabi. The new appointments comes days after the major international donors suspended aid to the council due to the lack of the leadership. Click here to read more (external link).